Eagle's View gets it's name because it is literally at the top of the mountain with spectacular, vast, long range mountain views that will take your breath away. The cabin creates a cozy, laid back atmosphere, bringing rustic and contemporary creature comforts together with all wood walls and a homey cabin feeling. You will want to spend lots of time on the deck unable to take your eyes of the rolling hills, endless mountain views, skies or stars stretching out before you. Enjoy panoramic views from most every room in the house, living room, kitchen, dining area, master bedroom even the game room in the basement. Experience a relaxing meal on the large deck with picnic table, unwind with a book on the porch swing, grill a nice dinner then savor a glass of wine and a long soak in the hot tub. On a cool evening enjoy a fire in the wood burning river stone fire place while curled up on the sumptuous leather sofa under a warm throw to watch a DVD from the expansive library, on the large flat screen TV or watch the satellite TV selection. Everyone will enjoy the combination pool/ping pong table, Wii, or board games in the basement game room. You may choose to roast some hotdogs or make s'mores in the natural stone fire pit while watching for shooting stars. Later in the in the evening retire to the king master bedroom with a comfortable memory foam mattress then step out onto your own private balcony or stay inside and watch the flat screen TV. Each bedroom including the queen bedroom upstairs and queen bedroom suite on the main floor has a modern feeling with contemporary furniture and comfortable memory foam mattresses. Eagle's View is a place to relax and play. Eagle's View will give you a new outlook and it will be a place you will not want to leave. 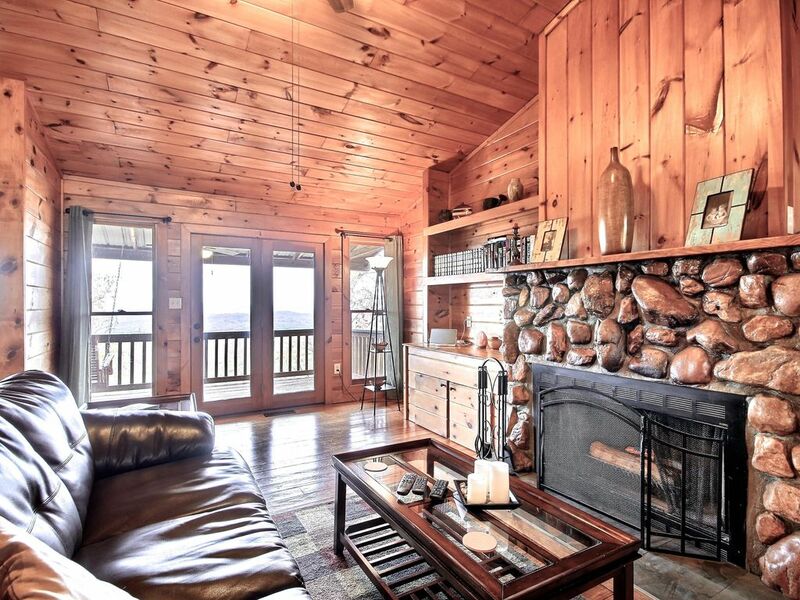 Eagle's View is a Morganton, GA address about 20 minutes to downtown Blue Ridge. Expect steep gravel roads because you get that incredible view from the top of the mountain. Four wheel or all wheel drive recommended. We live in Woodstock and have very busy jobs along with a fast paced lifestyle. We wanted a place to get away, relax, yet be able to get work done if necessary. It is great to have a place that seems so far from our city life yet it is so close to Atlanta. We love the change of seasons, mountain views and many activities Blue Ridge provides. The moment we saw the view we knew this was the home we wanted. This cabin home has been completely remodeled to create a cozy yet contemporary comfortable feel. We loved the tongue and groove wood throughout and the porch. The home needed extensive renovation but we were willing to do it because of the location and the view. The bathrooms and kitchen have new custom tile and glass tile showers and countertops, the basement was finished and a bathroom added. All new appliances, light fixtures, window coverings, custom kitchen cabinets. This home is our luxury vacation home with all the indulgences we could ever want. The town of Blue Ridge has so much to offer shopping, amazing restaurants, theatre, music, festivals, and art. Eagle's View is literally far above other Blue Ridge cabin rentals. Climb the steep roads to the top of the mountain and you will complete your adventure to see where Eagle's View gets it’s name. A cozy all wood cabin both rustic and contemporary. All bathroom have custom tile counter tops, custom tile showers, and glass tile accents. All linens are professionally laundered, plush towels, hand towels, wash cloths, shower gel, lotion, shampoo, conditioner, makeup mirror and blow dryers provided. The minute we opened the doors we were impressed. Hose thought of everything including pots, pans & games. After grocery shopping there was no need to leave the cabin. Views are so spectacular & relaxing. Well kept home with amenities. My wife and I greatly enjoyed this cabin. The drive up the mountain was not too bad, but as Susan mentions in her directions - if you use only GPS to get there you may end up in the wrong place - ours tried to take us down a different road on the mountain, so follow the written directions as you get closer. We enjoyed the goodie bag that Susan prepared. The cabin was well-kept and the views of the surrounding area were amazing. We loved the layout of the cabin - there is ample space for larger groups. All-in-all we had a great anniversary weekend. Thanks! This place is perfect! It’s so cozy, quiet, and private. It was so clean and nice. The views are unbelievable. I highly recommend a 4 wheel drive vehicle. The drive up to the cabin is a little tricky, but way worth it. I would definitely go back again. Rented this cabin for my family for the weekend to attend a wedding in Blue Ridge. It was rough finding it the first day, and since it was raining it made the drive up the mountain very difficult. Once we made it and saw what a great view we had it was worth it though. Not a great place if you plan on going back and forth a lot like I had to do, but an awesome place if you really want to get away for a few days. Will definitely be back! Loved our stay at Eagles View! The view is amazing and loved the hot tub! Everything was super clean! Very cozy with all the amenities we needed! (Might want to get a can opener tho). Blue Ridge is an adorable town with shopping, antiquing, fly fishing, trout fishing, lake, marina, boating, water skiing, hiking, waterfalls, swinging bridge, train ride, bird watching, many hiking trails, wineries, orchards, hunting, local theater, a downtown area with shops, restaurants, art and more. From fine dining to BBQ it is all in Blue Ridge. Lake Blue Ridge ��� is the perfect place for water sport and play. It is a pristine clear lake surrounded by mountains. There is a marina on the lake which offers pontoon boat rentals, a store, boat ramps and boat slips. North Georgia is famous for it’s many streams and world class fly fishing. Serious trout fishers come from near and far for some of the best trout fishing anywhere. Toccoa river: The Toccoa is stocked at various points and provides some of the best trout fishing in North Georgia. Much of the river is on private land but public fishing areas can be found along Rt. 60, near the town of Margaret. Shallowford bridge/Above the Dam ���� Fish under the bridge or along the dirt road. This is a catch and release fishing area. Tammen park - Blue Ridge – Another popular place to fly fish on the Toccoa River below the Lake Blue Ridge Dam. The Benton MacKaye Trail along with the Appalachian Trail provides the best hiking in Georgia. There are many entrances to the trail that can be found throughout the Blue Ridge area. The trail is marked and is also suitable for mountain biking. This is a fun quick trip, on the Benton MacKay Trail. This 270 foot long bridge is the longest swinging bridge east of the Mississippi River. Look over the Toccoa River and enjoy the fun and beauty of the bridge.